There are watershed moments in the history of popular music when the planets align, and the sense of change is palpable. Moments when the right guitar, in the hands of the right player, at precisely the right time causes a seismic shift and redraws the landscape. In loosely chronological order, here are 10 guitars that changed music, and 10 players that broke down the door for a generation to follow in their wake. For all the soul-selling mythology associated with the shadowy figure of Robert Johnson, the impact on modern popular music of the 1961 King Of The Delta Blues Singers compilation album - recorded during two sessions in 1936 and 1937 - is hard to overstate. For the likes of Bob Dylan, Keith Richards, Eric Clapton and Jimmy Page, Johnson's primal delta blues was a pivotal influence, with Clapton describing Johnson's music as "the most powerful cry that I think you can find in the human voice." In 2006, a New York memorabilia dealer attempted to sell an L-1 purported to be Johnson's guitar for $6 million, but its authenticity was never corroborated. Widely regarded as the first electric 'lead guitarist', Christian's work in Benny Goodman's Sextet paved the way for bebop. Christian's horn-inspired lead lines were a precursor of the sounds of T-Bone Walker, Wes Montgomery, Les Paul, BB King and many more. 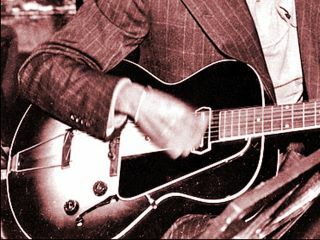 The single-coil blade pickup on his ES-150 (Electric Spanish, $150 price) has come to be known as a Charlie Christian pickup. When Fender's curvaceous, futuristic new Stratocaster arrived in 1954, few could have predicted that it would become the most successful electric guitar design of all time. One of the most enduring images of early rock 'n' roll is the combination of Buddy Holly's heavy-framed spectacles and sunburst Stratocaster. The likes of The Shadows' Hank Marvin - recipient of the first Stratocaster to arrive in the UK - and John Lennon were immediately smitten and popular music would never be the same again. The chiming opening chord of A Hard Day's Night has been the subject of much conjecture over the years, but the fact that it launched the electric 12-string on the world stage is beyond question. Its jangle would resonate via The Byrds through to Johnny Marr and beyond. Harrison's first 360/12 was the second Rickenbacker 12-string ever made and the first to feature the brand's unconventional 12-string configuration, with the octave strings occurring second in the string pairs. My Generation's blistering bass solo was the first time most of the world heard a bass guitar used as a lead instrument. The Ox originally intended to utilise the extra treble of a Danelectro Longhorn in the studio, but after a succession of broken strings, his more reliable Fender won out. A decade later, the likes of Geddy Lee and Jaco Pastorius would take the humble Jazz Bass even further into uncharted territory. The Holy Grail for vintage collectors initially misfired on launch, but nobody did more to spark the Les Paul Standard's skyward ascent than Slowhand at the height of his powers. The combination of Les Paul and Marshall on the 1966 'Beano' album would pave the way for Page, Kossoff and countless others to define the sound of rock guitar during the following decade. 2010 saw Gibson recreate this hugely important axe. A decade after Buddy Holly, Jimi took the Stratocaster on a sexually-charged interstellar voyage that didn't so much redefine the boundaries of the electric guitar as blow them to smithereens. Hendrix used and abused lots of guitars in his all-too-brief career, but his white 1968 'Woodstock' Strat is the most iconic. Microsoft's Paul Allen is reported to have paid a cool $2 million for the instrument, which now resides in Seattle's EMP Museum. For guitarists of a certain age, Van Halen's 1978 eponymous debut album was year zero for rock guitar. EVH set the bar for the lead guitar fireworks that would dominate mainstream rock for the next decade sporting a mongrel, self-assembled guitar with an original Floyd Rose, a Gibson PAF borrowed from an ES-335 and that iconic striped paintjob. If you can track down one of Fender's 300 incredible Frankenstein replicas issued in 2007, expect to pay upwards of $25,000. Or just make one yourself like Eddie did. The Ibanez Universe was the first commercially-available modern seven-string electric. Developed in collaboration with Steve Vai, the model went into production in 1990, but demand was low and 1995 saw no new models produced. 1996 was a different story though, and its use by bands like Korn and Fear Factory saw the Universe reintroduced, with the rumbling low B of a seven-string becoming de rigeur for the burgeoning nu-metal scene. Lately, a whole generation of djentlemen have taken that extra string and made it a pivotal element in their sound. Although Jack White uses a number of different guitars, his red and white resoglass pawnshop/junkshop prize is the one with which he's most readily identified. In an era in which to many guitarists the blues means thousands of dollars worth of boutique gear and the pursuit of some sort of tonal Holy Grail, White is both a beacon and a conduit. Through his raw, visceral music it's possible to reconnect with the white knuckle, seat-of-the-pants blues of the likes of Robert Johnson and Son House while simultaneously exploring new themes and sounds.